So today we went to the doctor for the 20 week ultrasound. I guess this is actually 22, but who cares...the better our chances of seeing something, right? Well after 5 1/2 months of hoping, wondering, and all of the anxiety that goes with it, I am proud to say that daddy has a little buddy! A little boy...he was moving all around and wasn't bashful at all:) Of course both of us would have been happy either way, but I must say this visit today made us a very happy couple. Mommy wanted a boy, Daddy wanted a pal. So now mommy can actually start planning her nursery....and narrowing down the list of her favorite names. Daddy can start looking for all kinds of UNC baby wear, because face it, boy blue is really Carolina Blue:) Grandpa Smitty is gonna have to throw a small life jacket in the boat, and Grandpa Nap needs another ticket to the Magic game. YAY! It's a Healthy Baby...Boy!! Congrats happy parents! Let the nursery planning begin! CONGRATULATIONS!!!!!!!!! How exciting to know!!! And he's gonna be wonderful and you're going to be a GREAT little boy mommy!!! 1. He looks just like you. 2. My seven year old asked me if he was "one hundred percent boy" and I told him he certainly was. Then he asked me if I could tell him the names of other kids that I thought might be fifty percent boy. He was wondering what they looked like. 3. Congratulations. I have four boys and two girls and I would gladly trade those two girls in for four more boys any day. 4. Boys rule, girls drool. Well damn, that's the best money shot I've ever seen on an ultrasound pic.. for real!!! Congrats on a little boy. That's awesome. You're gonna LOVE raising that little guy. Even though I always dreamed of having one boy and one girl (you know, the good ole' American dream), I wouldn't trade my boys for nothing. Happy Shopping!! Ha, you made me laugh because I didn't even remember what I wrote! Now I remember and it was all true. No mistaking THAT ultrasound! 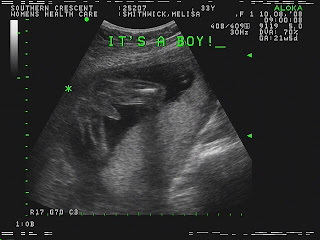 Big congratulations on your little man! You mentioned nursery decorations awhile back on my blog. Let me know if you'd like any help. I love that kind of stuff! He's showing off!!! Congratulations! I love having a baby boy! Little stinker leaves us looking at each going, "did he just do that????" Tell us your nursery thoughts! HMM as a MOTHER OF TWO BOYS I will say you will get your wish with the FROGS, WORMS and DIRT! O YEAH! SO HERE IS MY BIG FAT CONGRATS to you guys!!!! CONGRATS CONGRATS!!!!!! Congrats guys! Have a blast decorating that baby's room! Heehee and congrats! We have a little girl and two little boys and MAN there is nothing like a Mama's boy, a Daddy's girl, a Mama's Princess and a Daddy little buddy. Its all good and the BEST of luck to you all!